The Eerie Silence by Paul Davies (2010) is a popular science book which “explores the possibilities of intelligent extraterrestrial life, and its potential consequences” (Wikipedia). The reading we were provided included the end of Chapter 6 “Evidence for a Galactic Diaspora” and the beginning of Chapter 7 “Alien Magic”. At the end of chapter 6, Davies focuses on how ETI may be responsible for the lack of certain high-energy objects that have been predicted by theoretical physicists but have remained elusive. Most grand unified theories (models where the electromagnetic, strong and weak forces can merge at extremely high temperatures) require a magnetic monopole. These particles would have extremely high mass energies, so maybe ETI is scooping all of them up and annihilating them whenever it needs more energy. Don’t know what to do with that possibility, but I guess it could be true. At the beginning of chapter 7, Davies talks about alien technology. It is possible that alien technology will be just that, alien. We may not be able to distinguish what it does or even that it is technology at all. Becuase of this, Davies wants technology to be known as “nature-plus”. Technology does now break the laws of nature, it simply arranges pieces of it together in a way to harness these laws to do a useful function (like break rocks, or in the case of art, inspire/express emotion). He suggests that we should avoid our own human biases in trying to think of what ETI may want/is capable of. That being said, the known laws of physics should be used as a basis, because without them, there is only speculation as to what ETI can do, which would be both endless and pointless. That is a good point to keep in mind I think. It is hard to work in a field where you have only a limited idea of the capabilities and desires of what you are searching for (there might be a connection here to USA/USSR trying to figure each other out during the cold war, but even then they had a lot more information on each other than we have on ETI), but it is still important to not lose sight of reality. We may not like that we only know what we know now, but we just have to live with it and do the best we can. That’s all we can (and should) do. In Lin et al. (2014), an interesting possibility of using biosignature detection to infer the presence of not just life, but intelligent life, is explored. One way you can infer the presence of life on a planet is to look at the atmospheric ratios between compounds, elements, or isotopes in an atmosphere and find that they are out of equilibrium. For example, if you found molecular oxygen in combination with a reducing gas, there would be a readily available way for life to generate energy by harnessing the changing energy by combining oxygen with the reducing gas. But what if you wanted to use atmospheric biosignatures, to find ETI instead of plain old dumb life? It has been suggested that we could look for signs of pollution in exoplanet atmospheres to guess at the presence of ETI. While high concentrations of molecules such as methane (CH4) and nitrous oxide (N2O) can be suggestive of polluting life, they can also be created by unintelligent sources. While finding weird amounts of CO2 can be explained away, looking at more exotic compounds (namely specific chlorofluorocarbons) can provide much stronger evidence that life exists. Not only are they only significantly produced by unnatural processes, but some of them have short lifetimes, which could constrain how recently the ETI was on that planet. What is extra cool about these molecules is that in high concentrations (~10x what we have here on Earth), they should be detectable with ~1 day of JWST time (RIP early 2019 launch date) for a planet around a 6000K white dwarf. If one wanted to be silly, they could suggest using these unnatural CFCs as a form of METI beacon to announce our polluting presence to the galactic club. Not that they’d want such a self-destructive member. In Wright (2018), the issue of SETI’s confusing taxonomy and several terms in SETI having multiple meanings is addressed. SETI’s place in the scientific landscape is often confused. It is not clear to a majority of people where exactly SETI stands in relation to subjects like astronomy, biology, or their field of intersection, astrobiology. 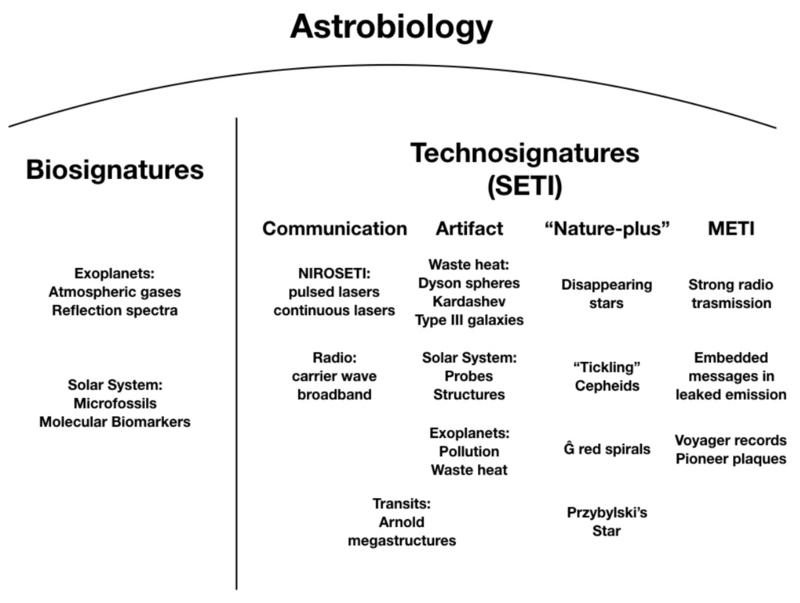 This paper seeks to place SETI (looking for evidence of technology) firmly in astrobiology as a separate, but equally valid approach for finding life (in comparison to looking for regular biosignatures). In addition to clarifying where SETI lies as a subject, the paper focusses on asserting the importance of having an unambiguous set of definitions for commonly used jargon. As SETI is so interdisciplinary, terms are often hastily borrowed from other subjects and used in whatever sense may be useful to the current study, but this methodology is unnecessarily confusing for those who read multiple studies and are trying to understand the subject as a whole. Sample definitions for terms like beacon and ETI are defined while some terms are suggested to be avoided like colonization and civilization. SETI’s highly interdisciplinary nature is emphasized in this paper by bolding every mention of a subject that isn’t SETI. While I think the method is heavy-handed, I don’t think that it is a wasted effort. It is cool to see just how many fields necessarily intertwine with SETI. Although, I would like to shame the editor for not ensuring a consistent usage of said bolding (the last paragraph on the left of page one: “the social sciences” versus the third to last paragraph on the right of page one: “the Earth sciences “). Shame. In Kipping & Teachey (2016), the possibility of using lasers to modify one’s planetary signature from a transiting exoplanet experiment is discussed. Advanced civilizations may have several reasons for which they might want to modify their planetary signal. You can use lasers to make your transit either more or less remarkable, but it depends on the type of survey you are trying to adapt to. For broadband surveys like Kepler, it can be a lot easier. If you somehow knew the frequency band of the survey you were trying to hide from, you could use a monochromatic laser near the peak efficiency to effectively modify your planet’s signature. For example, we could hide Earth from a Kepler-like mission with ~30 MW of peak power for ~10 hours a year (the duration of our transit). It gets harder to completely hide a planet for missions that take spectra, as you need many lasers (at least a comparable amount to the number of frequency bins the survey uses) and they need to produce the entire spectrum of energy instead of focussing on the most efficient detector energy (which you probably wouldn’t know anyway). For the Earth, this would require ~250 MW of peak power. I don’t really see the point of doing this when the civilization would still probably find you based on RV data or orbital analyses of the rest of the planets in the system. Something more interesting you can do is to just mask the atmosphere or even just the biosignatures so that Earth looks barren and uninteresting. This would take considerably less power (~1 MW for the atmosphere, or ~160 kW to mask a couple emission lines). You could also use about 1/100th of the energy of any of these methods to modify only the begging and end of the transit to create an otherwise impossible transit shape. In this way, you could quite effectively broadcast the fact that there is life on your planet. I find it more likely that ETI would use lasers for this purpose than as a glorified invisibility cloak. In Wright et al. (2014), a new, versatile optical SETI instrument is described that can search for direct evidence of interstellar communications via pulsed near-infrared signals. The article is in an SPIE (Society of Photo-Optical Instrumentation Engineers) conference proceedings paper and focuses heavily on the physical design of the detector and optics. Modern high-powered lasers can easily outshine our Sun (for limited frequency ranges and times). As such, it is obvious that, if advanced ETI exists and wanted to communicate (or just broadcast its presence) specifically with us, it could easily do so with lasers. According to the article, the largest lasers on Earth are detectable with meter-class telescopes up to thousands of light years away. This is because, unlike radio signals, optical beams can be finely focused, providing a high received power flux for each amount of transmission energy. Fast NIR pulses searches are an underexplored area not just for SETI, but for astronomy in general. Astrophysically-based nanosecond optical pulses are supposedly very rare, but this instrument is also planned to observed possible pulse sources such as pulsars, black holes, cataclysmic variables, gamma-ray bursters and active galactic nuclei. The instrument works by utilizing commercial-off-the-shelf (COTS) products including NIR photon counters that, for the first time, can be very fast, wide bandwidth, high-gain, low noise and cheap. The light from the sky comes in and the NIR light gets split into two independent detectors (to help eliminate false positive detections) while the optical light goes to a guide camera so that they know that the telescope is pointed at the right place. Their setup is capable of recording the time of arrival of signals down to the nanosecond and it is planned to be used on the 1-meter Nickel telescope at Lick Observatory in California. Is Love Really Stronger Than Gravity? In fictional story Gravity’s Whispers by Gregory Benford, we follow a nameless data analyzing protagonist (whom I shall call Alex) and a romantically apathetic LIGO scientist named Sam during the discovery of the unambiguous SETI signal. This story is an example of the science fiction background that has heavily influenced SETI thought. This piece can be seen as using the medium of fiction to communicate new SETI ideas, and is one of the few pieces of common literature with the suggestion of SETI messaging via gravitational waves. While incredibly difficult, gravitational waves could be one of the best ways to send a SETI beacon over the largest distances because the amplitude of gravitational wave signals only decreases as a function of 1/r instead of 1/r^2 like most other methods. In summary: Sam gives Alex a noisy signal which they decode and find a prominent mathematical sum (the Riemman Sum) and a highly sought after mathematical proof (to the Riemann Hypothesis). On the way to the bar for beers, Alex kisses Sam and he remarks that maybe its a good thing we can’t communicate back to this ETI. The story was a bit confusing to me. It is hard for short stories to pull the reader into the characters and make them investing, but I feel like the whole romance angle wasn’t well put together. It honestly gave off a creepy vibe for me. Alex has been interested in Sam for a long time, but it has so far been unrequited interest up until this point. Then, they proceed to kiss Sam without solicitation in a car ride where it is “a long drive back to Socorro”. While there is a line where “He kissed back, his eyes flickered, he grinned”, that is the only indication that this type of behavior was okay. It seems like a strange time to make a move on a collaborator and longtime friend (when they are trapped in a car and coming off such a big discovery). The quote continues “but he didn’t look happy. He grasped the steering wheel and peered ahead into the starlit darkness.” Alex believes he is thinking about the aliens, and the author suggests this as well, but the whole romantic interplay throughout the story felt unnecessary and seems to encourage harassment-y behavior. OMG WHY IS SETI ALWAYS IN THE RADIO WHY HAVEN’T THEY THOUGHT TO DO SOMETHING ELSE… They did? In Townes (1983), it is proposed that the commonly accepted view that SETI should operate in the microwave might not be as robust as it seems. Before this paper, most searches were proposed to be performed in the microwave region, but other regions of the EM spectrum can be shown to be more valuable when other considerations and conditions are used. For example, IR may be better than the microwave region if one considers the use of photon counting instead of linear amplification. We do not know what design parameters ETI considers important for METI, so we should be very cautious about limiting what frequencies we search for. The microwave region is good in that it can be searched in “right now” (in 1980s time). Shorter wavelengths could also be better if the geometric directivity of their telescopes can be utilized. The paper is notable for looking at previous assumptions in SETI and trying to remove ones that may be unnecessary or ill-motivated. I also appreciate that it stresses that we should not get too confident in our guesses for what frequency ETI will use. The paper still has practical considerations which will always be dated. It does not do a deep dive into the physical upper limits of transmission. This is not strictly a problem, but we now have technology that far surpasses that of this time, so the arguments for search recommendations are now outdated. Forgan (2016) can be viewed as a discussion of best practices for the documentation of SETI research. SETI researchers have some unique concerns when it comes to communicating possible positive results. A true positive SETI results would fundamentally change the way humanity views its place in the universe. The results would vary greatly, from riots in the streets to new religions praising the new alien deities. In response to the many concerns of SETI researchers, the International Academy of Aeronautics (I swear that’s their website) drafted some post-detection protocols to guide researchers in their interactions after the potential discovery was made. But these guidelines are dated and ignore how to communicate results to the public. Hence, this paper. In this day and age, the internet dominates the spread of information. While traditional sources of news (regular newscasts, newspapers, press conferences, etc.) exist, information reaches most people through tweet, status updates, and YouTube videos. This paper suggests that in addition to the regular procedures of holding a press conference and submitting a paper for publication, potential SETI discoveries should be actively discussed on public online forums. The data should be made available to the public and be checked over by as many people as possible. The authors believe it is the responsibility of the discoverers (and to a smaller extent the whole SETI community) to ensure that results are interpreted and communicated properly. They also spend a significant portion of time describing how SETI researchers need to be ready for this media craze when conducting any search and should be publicly documenting their research procedures, what they expect to find, and what would constitute a significant result in their experiment, both for people to see later to understand the experiment, and to show that they didn’t look at the data and then decide that it was significant. In Forgan (2018, submitted), an updated version of the Rio scale is proposed and justified. The Rio scale is a tool for communicating the significance of a signal to the general public. It works by assigning a score from 0-10 to possible SETI discoveries and attaching qualitative descriptions to each of these scores, ranging from insignificant (R=1) to extraordinary (R=10). The score is based on what the scientific and societal consequences of a signal being true would be and the probability the signal real. The authors feel that this scale could do with a revision to make sure its results are more accurate and transparent, especially to the public. The new (an old) version is split into terms that are calculated by following a decision tree that is presented in the paper. The first (Q) is concerned with the type, distance, possible contents of a potential signal. This term is directly linked to how societally impactful the signal would be. The second term (δ) is concerned with how investigatable the phenomena is and whether the signal is extraterrestrial in origin. δ is calculated using an intermediate J factor. The context for the Q and J values is presented, similar to the manner of the qualitative descriptions for R. A web-based calculator has been coded up for anyone who wants to toy around with it. It is suggested that these scores be calculated throughout the process of signal analysis, both by the original group and by other groups so that the public can understand the status of the detection as time goes on. I don’t know if it is because SETI experiments are inherently harder or if it is just much cheaper to work on these “If I were to work on a SETI experiment, I would do it this way” type papers, but this subfield of astronomy seems to spend an inordinate amount of time on this type of material (see search conduction and post-detection protocol papers by Gertz and Forgan). I understand that if a SETI result is found, it will be incredibly impactful, but it hard for me to see a field with such a dearth of experimentation spend its limited time and resources meticulously documenting the few experiments that are being done. I find it more likely that experimenters would work on producing more analysis results than making sure they have updated Rio scores for each step of their experiment. In an interesting (and refreshing for my workload) change of pace, we have been assigned a video in addition to the normal literature readings for this week. See below. In the clip, we see Neil deGrasse Tyson (NDT) and Stephen Colbert (SC) discussing the discovery of Tabby’s Star, a mature star found by Kepler that exhibits non-periodic dips in brightness, some of which are ~20% of the total brightness. The star also appears to be dimming gradually over time. Currently, we are unsure what is causing these phenomena. Upon first watching of the clip, I was a little disconcerted but was unable to figure out why. The first thing I noticed was NDT’s comment on the Kepler mission. Kepler was launched “to find Earth-like planets orbiting Sun-like stars”. Sounds good so far. “And there is a catalog of nearly 2000 of them now”. Aaaaand that is misleading as heck. I feel like I can confidently claim that a lot of people would interpret that as “We have found over 2000 Earth-like planets around Sun-like stars” instead of the actual fact that while Kepler was proposed to do one thing, it ended up finding exoplanets of all sorts (with a natural bias towards larger and smaller period planets). While this might be viewed as a nitpick, science communicators like NDT are often criticized heavily for misleading comments and errors in their appearances, and, it could be argued, rightfully so. Scientific communicators are the filters that bring the complicated and nuanced ideas (both new and old) within a field to a significant portion is the public. In this way, they have an incredible influence on the public perception of science. A power that is quite enticing (to me anyway). A good science communicator can drive public interest to a field (or science in general) for decades (eg. Carl Sagan, Bill Nye, Jane Goodall, and Steve Irwin are a few I could think of). It is important that they be correct and precise as often as possible. I understand when they, as fellow humans, make mistakes (I can’t even type a line of this post without having to hit the backspace key), but they have to be very careful because, to many, their word is gospel. They are the experts, after all. If you can’t trust them to get things right, who can you trust? It is hard in that people who become popular end up being asked to comment on broader and broader topics. As smart as they are, no one can be expected to have infallible knowledge of astronomy, physics, biology, climate science, anthropology, and every other topic of scientific inquiry. The comment that started this whole line of thought could’ve been worse, but it reminded me of this topic. The second bit that irritated me slightly was how SC makes his joke about how Tabby’s Star is definitely a ringworld (he has a picture! ), and interrupts NDT when he tries to respond. While I understand that SC has a job to do and is making a joke (sidenote: I chuckled), I am always uncomfortable watching something like this happening. Just the fact that NDT is there makes it seem like the scientific community as a whole stands by this opinion at some level (“Yeah, I was watching SC last night, and NDT was on and they said we found alien megastructures around a star!” (not trying to create a strawman, but to illustrate a possible outcome)). This type of thing can make the scientific community seem less credible and can impact the subconscious way that people view scientists and research. Now, I haven’t seen the full show this is from so I don’t know if they discuss it later afterward, but at least with this level of context, it is frustrating to see. I mean, it is also just a 2-minute segment from a late-night comedy show. Nothing in this clip is particularly awful. Nonetheless, it may act as a barometer of current societal trends and give insight to where these trends might take us.